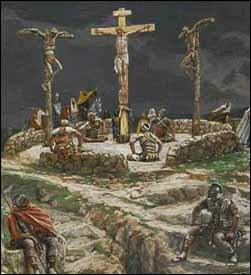 James J. Tissot, "My God, Why Hast Thou Forsaken Me?" (1886-1894), opaque watercolor, Brooklyn Museum. Full image. At the very center of the Seven Last Words, the Fourth Word is probably both Jesus' lowest point as well as a theological high point of the crucifixion. We'll spend a bit longer seeking to understand its implications. The early crowds have long ago dispersed and the long time of waiting for death had begun. An eerie darkness has descended upon the entire area, a crushing gloom. The criminals on either side are still alive -- and might have lived for days on the cross. But Jesus is not so strong. He has somehow endured a cruel scourging that would have killed lesser men. He has lost a lot of blood, even before climbing the hill to Golgotha and having his hands and feet nailed to the rough cross. Mark tells us, "It was the third hour27 when they crucified him" (Mark 15:25). Sometime after the crucifixion took place, Luke tells us: "It was now about the sixth hour, and darkness came over the whole land until the ninth hour" (Luke 23:44).28 Jesus lasts only six hours. When darkness falls, something changes. An eclipse has taken place not so long ago on November 24, 29 AD, but what takes place this day is no natural eclipse. A normal eclipse would have been physically impossible during the time of the full moon on which Passover falls. We aren't told how it happens. The darkening may have been caused locally by a hamsin or sirocco wind.30 We just don't know. 2. A fulfillment of prophecy. 5. The Father's judgment on the sins of the world being borne on Christ's shoulders as he hangs on the cross. This best fits my understanding of what was taking place at that time. The Lamb of God was bearing in himself the sins of the world! I don't think the similarity between the three days and the three hours is accidental. Mark uses the verb boaō to describe this cry: "to use one's voice at high volume, call, shout, cry out." It can be used of emotionally charged cries of joy or of excited crowds, but especially "of pleading petitions or anguished outcries." 33 It is used of a man begging Jesus to heal his son (Luke 9:38), of the desperate blind man who will not be silenced, but cries, "Jesus, Son of David, have mercy on me!" Luke 18:38), and of the shrieks of people as evil spirits leave them (Acts 8:7). It is also used of the voice crying in the wilderness: "Prepare the way of the Lord!" (Isaiah 40:3; Matthew 3:3, etc.). Eloi, Eloi, My God, My God! It is noteworthy that this is the only time that Jesus addresses "God" this way in prayer. In all his other recorded prayers he uses the term "Father," probably reflecting the intimate form Abba. But here in his hour of greatest desolation, he addresses God as would any other supplicant. This doesn't represent loss of faith. The fact that he is praying, "My God," shows that he still trusts God. But the intimacy of fellowship seems to have been broken. There is a loss of contact.37 Jesus can no longer feel his Father's presence. But clearly, Jesus senses that he is utterly forsaken by God. Doesn't Jesus' forsakenness somehow suggest that he wasn't divine after all? How could Jesus as Son of God be separated from the Father? Isn't this an oxymoron? Some have tried to lessen the incongruity by suggesting that by calling out the first words of Psalm 22 Jesus is calling attention to the entire psalm, which ends on an upswing of hope and triumph in verses 22-31. The phrase "Jesus cried out in a loud voice" makes it clear that this is a very real prayer reflecting the agony of the Cup drunk to its very dregs on the cross. �"My God, my God, why have you forsaken me? Why Is Jesus Cut Off from God? The question, "Why is Jesus cut off from God?" reveals the quandary that we're in. It suggests a division in the Trinity itself -- which is unthinkable! We have no theology to explain or describe it. But cut off, Jesus is. Why? God is holy and righteous, so much so that unholy men are in danger if they try to draw close to him -- "For the LORD your God is a consuming fire" (Deuteronomy 4:24; cf. Hebrews 12:29). We must keep our distance. Our sins and iniquities have caused a separation between us and God -- a great gulf or chasm between us. The Hebrew verb is bādal, "divide, separate, sever. "41 That he has "hidden his face from you" (Isaiah 59:2b) means that we can't experience communion with him or sense his presence in our lives. "He will not hear" (Isaiah 59:2c). The "cup" is used as a figurative expression for "destiny." Several times in the Bible we read of drinking a cup of suffering and judgment.43 Jesus refers to drinking "the cup the Father has given me" (John 18:11; Matthew 20:22; 26:39; Mark 14:36). Jesus' "cup," however, wasn't death, even death on the cross. His "cup" is the requirement that the holy Jesus bear our unholy sins and, as a result, receive in himself the judgment and punishment of God for our sins. Jesus knows that the cross would mean separation from God. He struggles hard against it. Yet in the end, he prays, "Not my will, but yours be done" (Luke 22:42). He has made his decision. Now the horror and magnitude of this "cup" come in full fury as the darkness of God's judgment grows heavy and he feels the Father's comforting presence sucked away. He who has been with the Father from all eternity is now utterly alone! The Father's focus at this hour is severe judgment upon the sins Jesus is bearing. Jesus' agonizing cry, "My God, My God, why have you forsaken me," enables us just a tiny glimpse of what it must have cost Jesus to die for our sins. Our forgiveness is not free, dear friends, neither for the Father nor for the Son. It wrenches them apart and puts them on opposite sides -- as enemies -- if only for a little while. Father, Lord Jesus, how can we ever thank You enough. In the face of such determined and sacrificial love, our paltry and vacillating love seems so unworthy. Teach us, teach me, to love You as You love me. Help us to be both able and willing to understand the costliness of real love as You do. In your holy name we humbly come, kneel at your feet, and pray. Amen. Q4. (Mark 15:34) What does Jesus' Fourth Word from the cross teach us about faith? About commitment? About love? What effect should this understanding have on our lives? What is the significance of Mark 15:34 including a quotation from Psalm 22? 27. Lane (Mark, p. 566-567) sees John's timing more credible than Mark's. Without any manuscript evidence Lane rejects Mark's "third hour" as probably "a gloss inserted by an early reviser." Others see more plausible an early trial with the crucifixion beginning around 9 a.m. and reaching a new phase between noon and 3 p.m. (France, Matthew, p. 1063, footnote 3). 28. The Jews measured time from sunrise, approximately 6 am. John tells us that Jesus' trial before Pilate took place about the sixth hour (John 19:14). There have been various attempts to reconcile this with the times given in the Synoptic hours. Based on two examples, Brook Foss Westcott (The Gospel According to St. John), put forward the theory that Roman time was counted from midnight, rather than the Jewish calculation of the hours from sunrise. But there seems to be no strong evidence to support this claim. For a discussion see Morris, John, pp. 800-801, footnote 34. 29. Ekleipō, BDAG 306. Luke's diction is standard for description of an eclipse in ancient Greek literature. 30. Marshall, Luke, p. 875. 31. Darkness is a symbol of ignorance, spiritual blindness, and evil (for example, Luke 1:79; 11:34; and often in the Gospel of John). 32. Philo, De Providentia 2.50. 33. Boaō, BDAG 180, 1b. Matthew uses the related verb anaboaō, "cry out" (BDAG 59). The word is also used of Elizabeth's prophetic cry upon seeing Mary (Luke 1:42). 34. In Mark, "Eloi" is formed from two Aramaic words, El, "God" + pronoun suffix "my." Brown (Death, pp. 1051-1058) provides a detailed analysis of the underlying language of this verse in Aramaic, Hebrew, and transliteration in Greek. 35. "Elijah" would have been pronounced "'Ēliyy�" or perhaps even "'Ēli" in a shortened version (S.C. Layton, Zeitschrift f�r die alttestamentliche Wissenschaft 108 (1996) 611-12, cited by France, Matthew, p. 1077, fn. 19). 36. Joachim Jeremias, "Hēl(e)ias," TDNT 2:928-941. 37. R.T. France says, "This shout expresses not a loss of faith, but a (temporary) loss of contact" (France, Matthew, p. 1077). 38. Enkataleipō, BDAG 273, 2. The Hebrew equivalent in Psalm 22:1 is ʿāzab, "to depart, to abandon, and to loose" (Carl Schultz, ʿāzab, TWOT #1549). 39. Joshua 1:5; Deuteronomy 31:6, 8; 1 Chronicles 28:20. 40. Lane says, "The sharp edge of this word must not be blunted. Jesus' cry of dereliction is the inevitable sequel to the horror which he had experienced in the Garden of Gethsemane" (Mark, p. 572). 41. Hiphil stem, Thomas E. McComisky, bādal, TWOT #203; BDB 95. 43. Isaiah 51:17, 22; Lamentations 4:21; Psalm 11:6; 75:8; Revelation 14:10; 16:19; 18:6. 44. "And Can It Be that I Should Gain?" words: Charles Wesley (1738), music: "Sagina," Thomas Campbell (1825). The full words and tune are available on HymnTime.com.